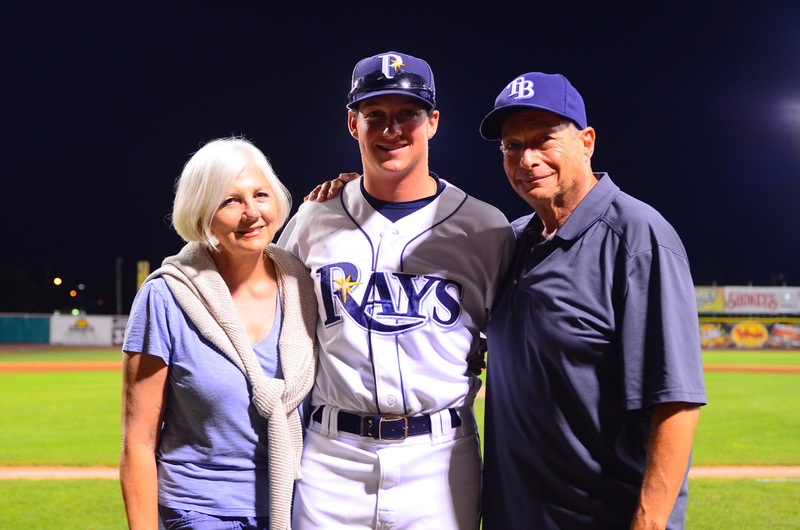 Kenny Rosenberg poses with his parents, Deborah and Ken, in his Tampa Bay Rays uniform. Deborah and Ken have remained fiercely loyal to Kenny's alma mater, and have established themselves as die-hard fans of Matador Athletics. Photo courtesy of the Rosenberg Family. Kenny Rosenberg speaks with CSUN Baseball Head Coach Greg Moore, the man who inspired him to attend CSUN. Photo courtesy of the Rosenberg Family. Kenny Rosenberg ’16 (Journalism) had a fairy-tale experience playing baseball for California State University, Northridge. 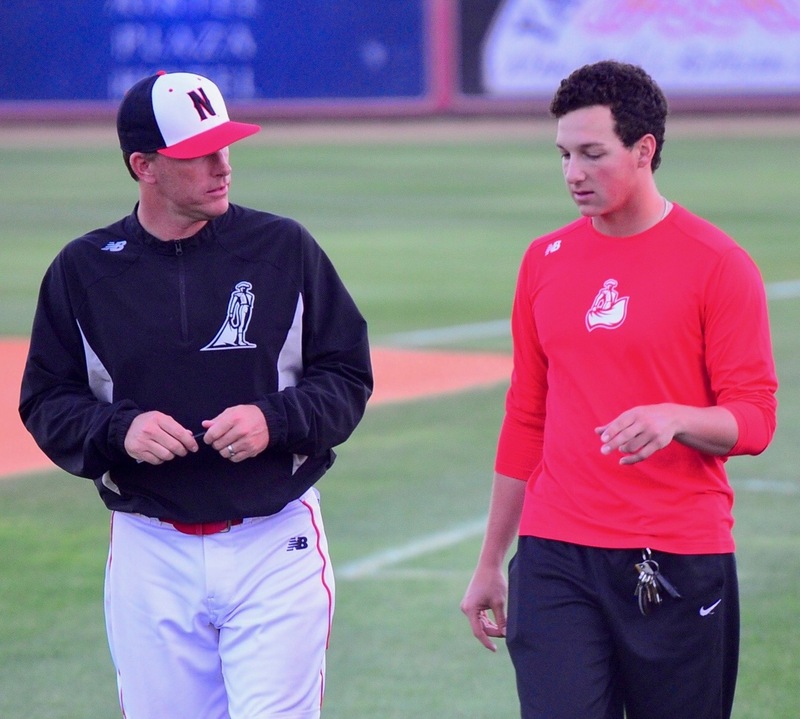 After visiting the University of San Francisco as a high school senior and meeting the school’s pitching coach Greg Moore, the Marin County native eventually moved to Southern California to play for CSUN and its new coach … Moore. Then, after playing three years for the Matadors, Rosenberg was drafted by the Tampa Bay Rays in June 2016. But that is oversimplifying his journey, and hardly taking into account all the parties that contribute to a student-athlete excelling and moving onto professional sports. Behind every great player is a key group of supporters to help him along. That’s where Kenny’s parents, Deborah and Ken, stepped up to the plate. Deborah, while being wary of the school she had barely heard of, was enthusiastic about Kenny’s new adventure, and became heavily involved with the CSUN Baseball program and the university as a whole. She began managing the bills for the apartment Kenny stayed in during his first year, and continued to do so three years later as more baseball players came and left. This help allowed team spirit to grow, and six of the apartments in the building are now occupied by members of the Matador Baseball team. The next step in Deborah’s involvement was supporting her son at the games, which was no easy feat given that she and Ken initially lived almost 400 miles away. Her Matador spirit shone through, and her commitment to the team was evident given that Kenny pitched a grand total of 11 innings during his freshman year, yet the Rosenbergs were consistent attendees at home and road games. On one occasion, Deborah found herself the lone Matador fan in the stands, but recognized how much it meant to the team when they walked out after the game to embrace her and thank her for coming. This involvement eventually expanded into tailgates before the games and inviting other parents to the games, and slowly but surely the bleachers started to fill with more supporters. “If you just say hello or give the players a hug, or say something nice about the game, they really like it. I found after doing that, it was just a natural progression to the next thing which was to start to financially support them, then buying seats in the tent, and then I dragged other parents into it to show them how cool it was, and have them thinking, ‘this would be a nice place to see the game next year.’ It’s a win-win,” Deborah said. Kenny’s father, Ken, was more than happy to join his wife in supporting the team, and hopes that their involvement can serve as inspiration to others. Ken was also vocal about the amazing treatment he received, and how the Rosenbergs’ involvement would not have been possible without the staff at CSUN that helped welcome the family and ensure that Kenny’s transition to college baseball was smooth and easy. Even though Kenny left CSUN for taking his shot at climbing to the Major Leagues (he finished 2016 in Single-A), the Rosenbergs still remain active within Matador Athletics, consistently going to games, supporting the players that are in the same position their son was just a year ago. Deborah admits there are some moments when she questions whether she would attend future sporting events, but quickly brushes those thoughts aside, reasoning that she is a fan now, and fans continue to follow their teams, even when their favorite players leave. She wants to see the Matador Athletic family grow, and has some words of wisdom for all CSUN parents who may be wondering how they could become more involved.